The biopharmaceutical industry is under attack. It’s not the first time. The public has always had a love-hate relationship with drug companies, dating back to the late 1800s. But even in the face of public pressure, Congress has always remained focused on curing disease and has opted against rash policy actions. That constancy has allowed U.S. biotech to lead the world. Investors don’t do well with uncertainty and they have perceived plenty in recent months coming out of the nation’s capital. The link between Twitter and volatility in the Nasdaq Biotechnology Index predates President Trump. 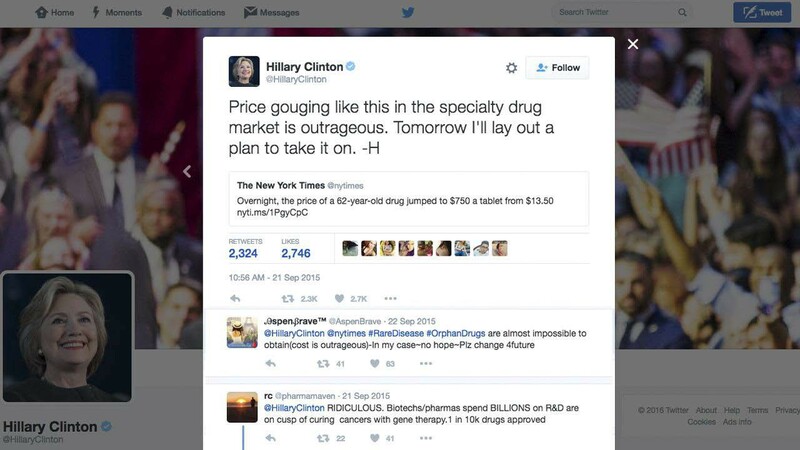 It began with a Tweet by Hillary Clinton during the presidential campaign vowing to crack down on price gouging. Biotech stocks tanked by 18 percent in the ensuing days and never fully recovered. Clinton lost but the trend endured. In the weeks after inauguration, certain presidential Tweets and comments caused additional volatility. But we’re starting to see biotech markets be less moved by a one-off press conference or interview. This is a highly sane development. There’s a long road from a Tweet to congressional enactment of a new law. I’ve spent a quarter-century in Washington. I sympathize with investors and analysts. It’s a lot easier to analyze a company’s prospects than it is to analyze what Congress might do next. There’s plenty of chatter coming out of Washington lately on drug prices. I would urge investors not to let that cloud their judgment. The therapies in development are unlike any we’ve seen in the history of medicine. This is an extraordinary time for biotechnology. We at BIO are not going to let bad policy get in the way of the incredible promise of tomorrow’s breakthroughs. Patients with incurable diseases are counting on us, and we won’t let them down. 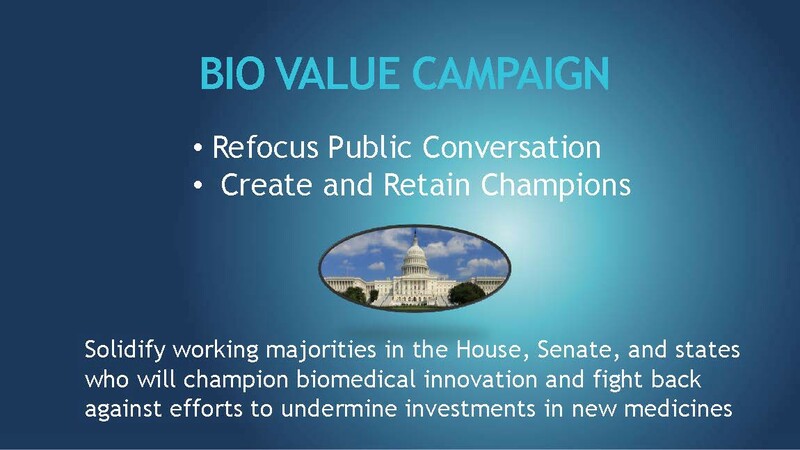 Last year, BIO launched our “Value Campaign.” We have two goals: to cultivate political allies and to change the conversation on price to a conversation on value. We want people to understand that biotech companies do more than manufacture pills and biologics. They offer the most precious thing of all: more time to spend with our loved ones. These are exciting times. Biotech companies are making discoveries that were unimaginable a decade ago. Researchers can now isolate and repair defective genes and train our immune system to attack cancer cells and leave healthy cells alone. The science is galloping forward. The only thing that can stop us is bad policy. I don’t think that will come to pass, though. I’m bullish about our industry’s future. It’s no secret that President Trump wants to bring down drug prices. That’s a goal that the biopharmaceutical industry shares. But to accomplish this, we have to harness rather than abandon the free market that got us here. BIO supports bringing down prices through enhanced competition, not coercion. Some investors are concerned that Congress might enact draconian government price controls. In the biotech sector, risk is an everyday reality. Biotech is synonymous with risk. But political risk is something different; it can cripple innovation. I spent 12 years in Congress, chairing a House Energy & Commerce subcommittee under then-Speaker Newt Gingrich, and I still spend a lot of time on the Hill with my former colleagues. Let me reassure biotech investors: Our industry is well-positioned. For price controls to become law, it would require the House and Senate to negotiate a bill both chambers can support. I don’t see that happening any time soon. There’s isn’t majority support or leadership support for price controls of any kind. We just had an election. The American people made their choice. We have a businessman in the White House, and free-market Republicans controlling the Senate and the House. Yes, our new President can be an enigma. The Presidency is the first public office he’s ever held. There’s not the usual paper trail of votes and policy positions. A lot of the complex issues confronting the President are matters of first impression, subjects he never encountered building a real estate empire. I remember coming to Congress in 1993 and surveying the vast array of critical issues put before me. It was sobering, and I had spent 12 years in the Pennsylvania legislature to prepare myself. There’s a learning curve for every new officeholder, especially when he has the toughest job in the world. This much we know already: President Trump has a CEO’s mindset. He gathers information. He consults a range of people on both sides of an issue. It’s not surprising that his views evolve as he gathers facts and consults different voices. We’ve seen people run to the press to try to lock him in on a position based on their interpretation of his views. In politics, this is rarely a winning strategy. I suspect this goes double with Donald Trump. We at BIO have taken a different approach. We believe in quiet diplomacy. In my experience, successful CEOs who spend time gathering information from diverse perspectives are more likely to make the right call in the end. For instance, some counseled the President to put at the helm of the Food & Drug Administration a leader who might take a radically different approach to drug approvals. Others advised him that it’s critical for patients and innovators for the FDA to remain the global, gold standard. The President has since nominated Scott Gottlieb, who believes we can have meaningful regulatory reform without compromising on safety or efficacy. President Trump has chosen known entities and strong free-market reformers to lead FDA and the Department of Health and Human Services. 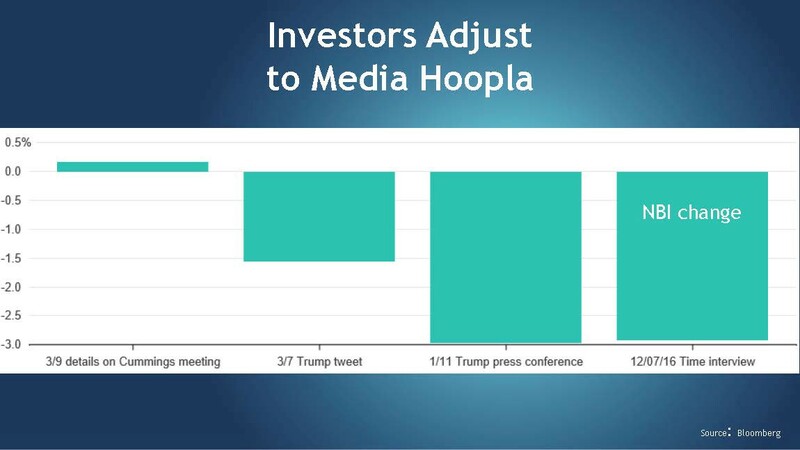 This is actionable intelligence for investors, far more so than any single Tweet or quote. There’s a saying in Washington that “personnel is policy.” Savvy investors who’ve studied the positions and credentials of President Trump’s key personnel choices are rightly confident about placing bold bets on biotechnology stocks. 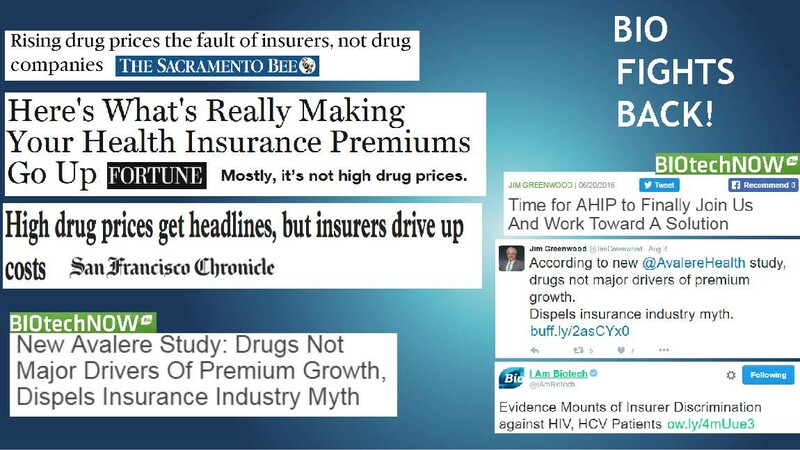 The current public debate on drug pricing was fueled by the insurance industry. The cost pressures of the ACA pushed many insurers to raise premiums, deductibles, co-pays and co-insurance. They knew this would be painful for patients and policyholders. So they set out to find a scapegoat. 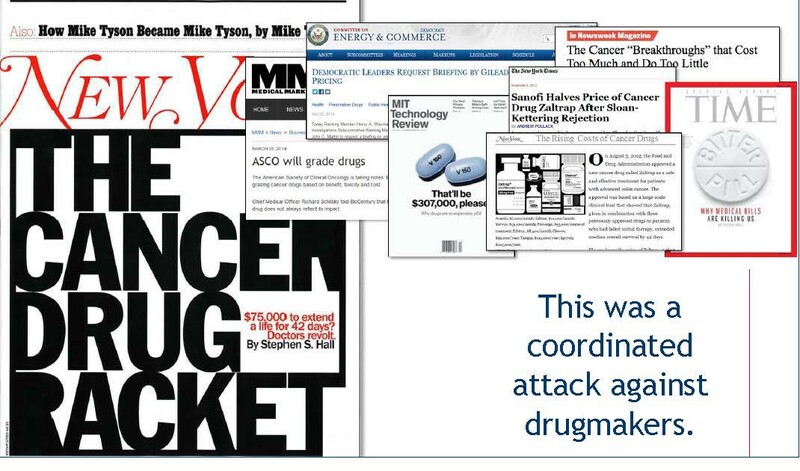 And so began a barrage of media attacks on drugmakers. The insurance industry enlisted universities and think tanks to give their effort the veneer of impartiality. Meanwhile, vast numbers of patients are being asked to pay large percentages of a branded drug’s list price — hundreds, sometimes thousands of dollars — instead of an affordable co-pay. Many patients simply don’t have that kind of money and are forced to go without. Yet in the court of public opinion, the insurers’ PR gambit worked. Patients have been shocked at what they have to pay out of pocket. They’ve been told to blame the drug maker when it’s their insurance company refusing to cover their meds. The national share of health care spending on medicines remains the same today as it was 50 years ago: about 10 to 14 percent. To paraphrase de Tocqueville, it’s easier to believe a simple lie than a complex truth. Only after a coordinated effort by BIO and our allies to fight back have we finally begun to see more balanced coverage. More people are learning how middlemen take their cut and profit from the status quo. Insurance companies and pharmacy benefit managers (PBM) pulled off a hat trick: They shifted costs to patients. They shifted blame to drug innovators. And they shifted the media’s focus to list prices, while taking a hefty cut off of those very prices. Insurers regularly blame their premium increases on rising drug prices, but this charge simply isn’t true. Based on their own data, three quarters of insurance premium growth is driven by increasing payments to hospitals and doctors. Just 17.7 percent of premium increases in the ACA market come from prescription drug costs. This degree of cost-shifting is not happening in other sectors of health care. 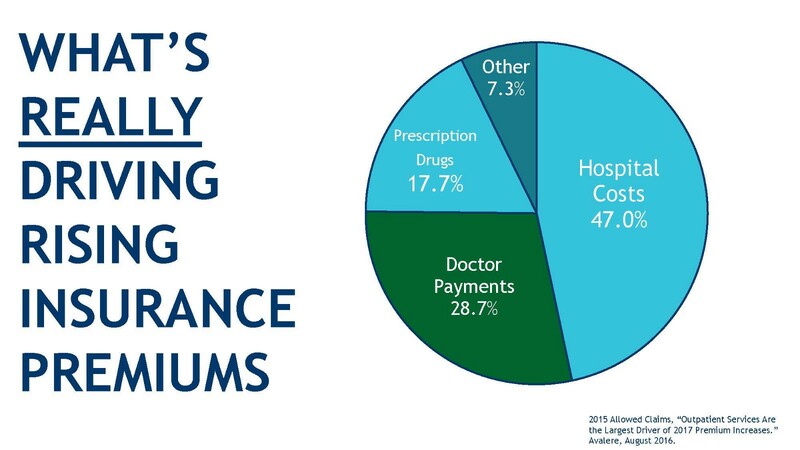 Patients have to pay just four percent of their hospital bill, on average, but insurers make them pay a cost-sharing percentage five times greater for their medicines. When policy makers are presented with credible information like this, they are much more likely to reject short-sighted proposals that would kill innovation. So let’s dispel two myths. 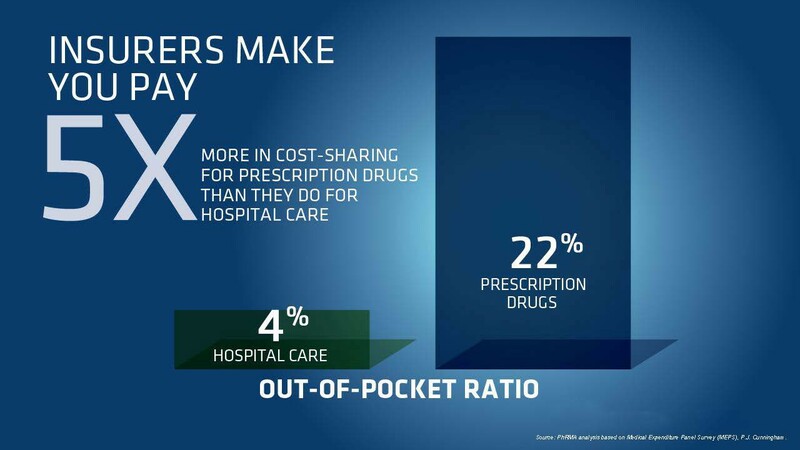 First, drug companies don’t set patients’ out-of-pocket costs. Insurers do. Second, rising drug prices are not the real driver of health care costs. Medicine keeps people out of hospitals and doctor’s offices, which are the primary cost drivers. 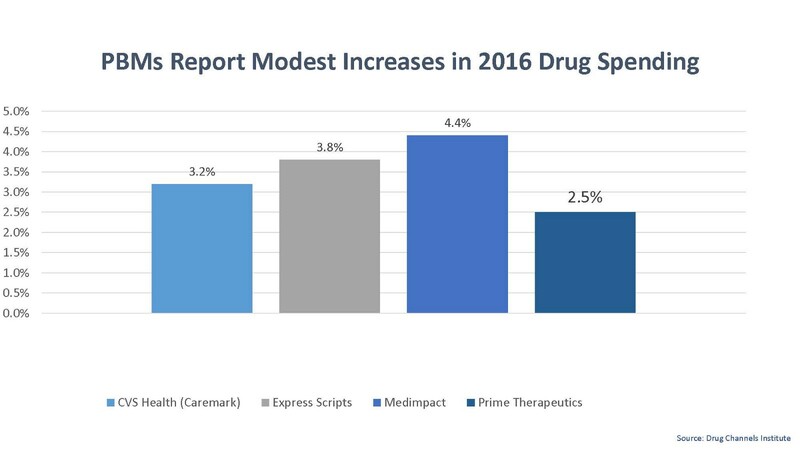 Four of the largest PBMs recently released their 2016 drug trend reports. 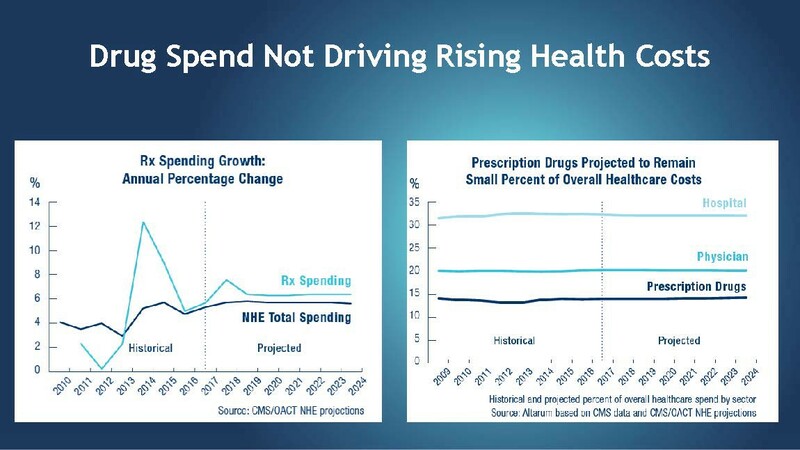 All reported average drug spending increases in the low single digits. About one-third of PBM clients reported declines in pharmaceutical spending last year. CMS actuaries say prescription drug spending decelerated faster than any other health care category last year. Outlays for medicine actually slowed the overall rate of health care spending growth in 2016. Drug spending growth spiked in 2014–2015 due to a breakthrough treatment for Hepatitis C. Since then, it has dramatically slowed. CMS projects drug outlays to grow in line with overall healthcare spending for the next decade. CMS also projects that drug pricing growth this year will be a mere 1.6 percent, the lowest inflation rate for drugs in a decade. We’re working hard to convey these facts to the President’s team and we’re conveying that when it comes to biotechnology, America is first. 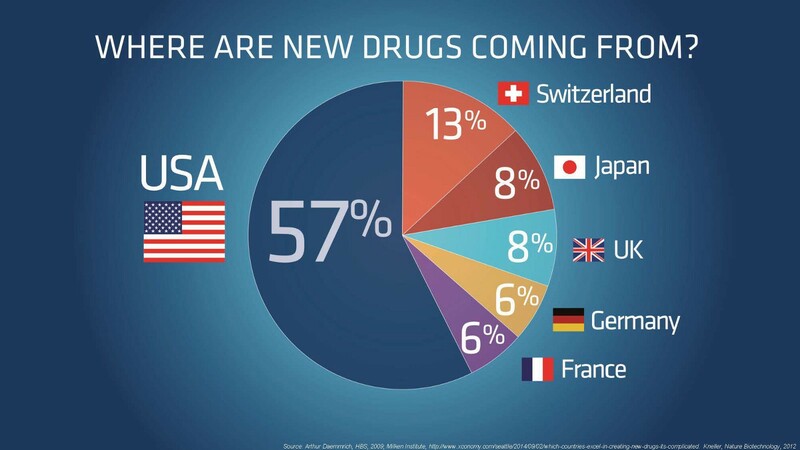 We produce more new drugs than the rest of the world combined. Our success is made possible by a number of factors: outstanding scientists, savvy entrepreneurs, world-class research universities, a culture of second chances and investors willing to take risky bets on life-saving cures. Our ecosystem is second to none, but other countries have similar capabilities. What allows us to produce 57 percent of the word’s new drugs is our government’s refusal to impose artificial limits on successful innovation. with socialized medicine, we can expect to get the level of innovation found in countries with socialized medicine. In fact, price controls here would harm biomedical innovation in Europe and Asia, because companies there look to our free market to recover their investments. We make sure policy makers on the Hill understand that the National Institutes of Health (NIH) cannot pick up the slack on applied medical research if private investors start putting their money elsewhere. We constantly remind Members of Congress, including every incoming class of freshmen, that the NIH doesn’t invest in developing new drugs. The NIH spends $30 billion a year on basic medical research. The American private sector spends $70 billion a year on applied research to develop actual medicines. Globally, the private-sector R&D number for the biopharmaceutical industry is $150 billion annually. American biopharmaceutical companies reinvest 21 cents of every dollar into creating the next generation of treatments and cures. 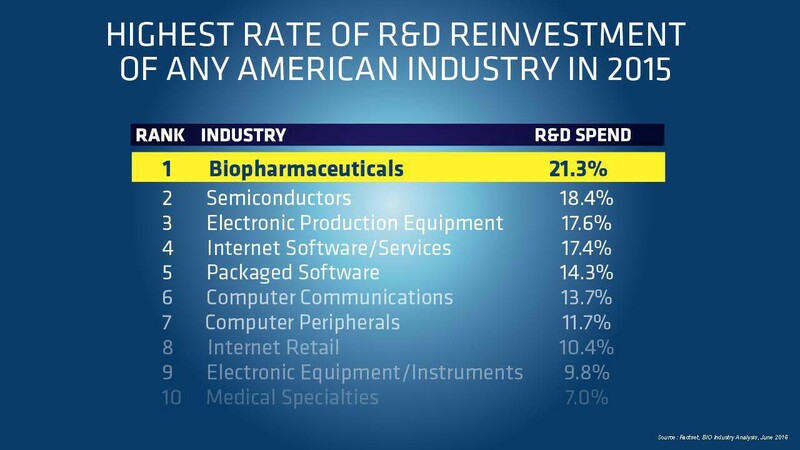 No American industry spends a higher percentage of its sales revenue on R&D. In any given year, biopharmaceutical companies spend five times more on R&D than the aerospace industry and more than double that of the software industry. We will continue this commitment as long as the government gives us the freedom to innovate. Investors ask me whether Congress might mandate price negotiation under Medicare Part D, to which I reply: Drug prices are already negotiated under Part D by sophisticated insurers and PBMs. And they’ve been quite successful at it. The cost of the program has come in at $350 billion under the CBO’s initial 10-year projection. Medicare typically gets better discounts than the commercial market does for the same drugs. As we’ve seen in other countries, governments don’t negotiate prices. They dictate them. 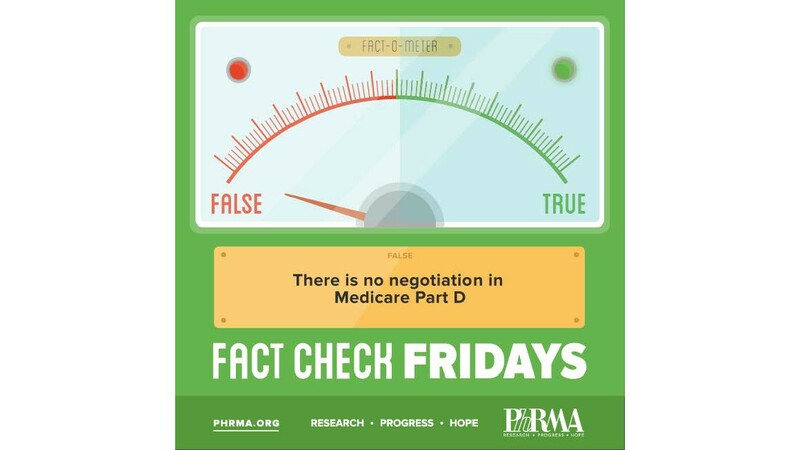 The Congressional Budget Office says direct Medicare negotiation would not save the government money unless it also had the power to dictate drug prices and drug choices through a government formulary. That’s a non-starter for most Members of Congress. Doctors, not government, should be determining seniors’ medicine options. I mentioned the lack of support in Congress for proposals that would substitute the judgment of government for that of the markets. That’s especially true when the government in question isn’t even ours. Drug importation is a way to get around market-based pricing in our country by importing foreign price controls. The media coverage of the drug importation issue often neglects to mention that such legislation already passed Congress in 2003. But that law included a provision saying that the HHS Secretary must certify imported drugs are safe before they can enter the country. No HHS Secretary or FDA Commissioner of either party has ever been willing to do so. Recently, the last four Commissioners — two from each party — co-signed a letter warning that importation puts patients at risk. 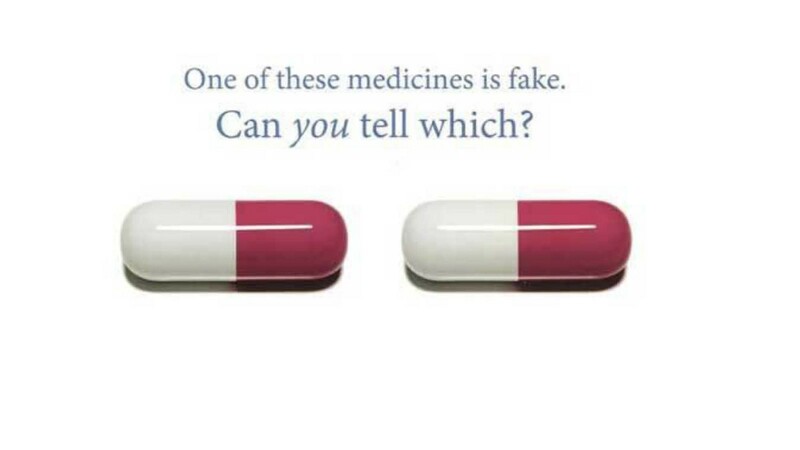 They noted counterfeit drugs are one of the most lucrative avenues of organized crime. For all of these reasons, Senator Bernie Sanders’ importation bill will not become law. I’ve also received questions about the President’s budget. We were encouraged to see the budget fund implementation of the 21st Century Cures Act. We hope this demonstrates the White House’s commitment to adequately staff the FDA and use cutting-edge new tools in the drug approval process. We were less encouraged by the budget’s proposed cuts to NIH. 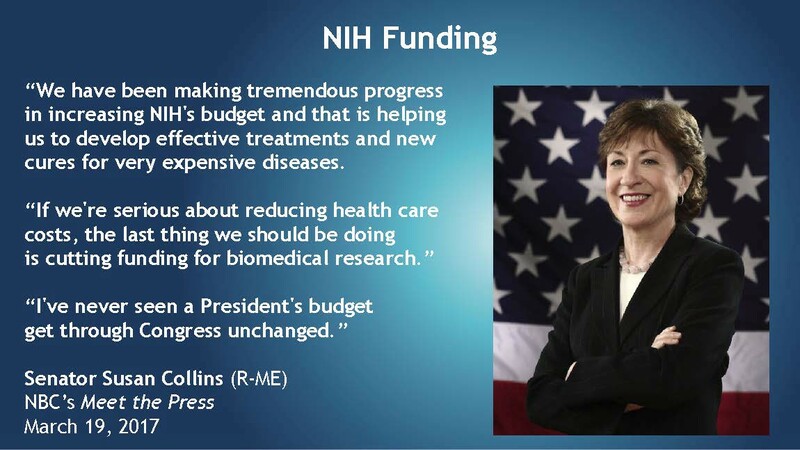 Last Sunday on Meet the Press, Senator Susan Collins pointed out that researchers are curing expensive diseases and saving us money. She said, “If we’re serious about reducing health care costs, the last thing we should be doing is cutting funding for biomedical research.” Most members of both parties share this sentiment. 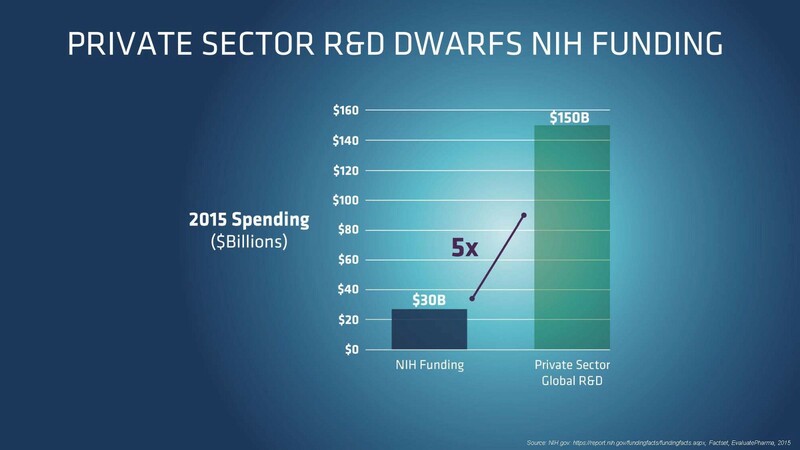 I believe NIH cuts are DOA on the Hill. Finally, on health care reform, BIO is advocating for our health insurance system to do what it’s supposed to do. That means no annual or lifetime limits on coverage and reasonable restrictions on out-of-pocket costs. We believe imposing the highest costs on the sickest patients defeats the purpose of insurance. We’re also pushing to modernize government rules so the private marketplace can evolve more rapidly to a value-driven system. As we launched our Value Campaign last year, I observed that we needed to simplify our message. 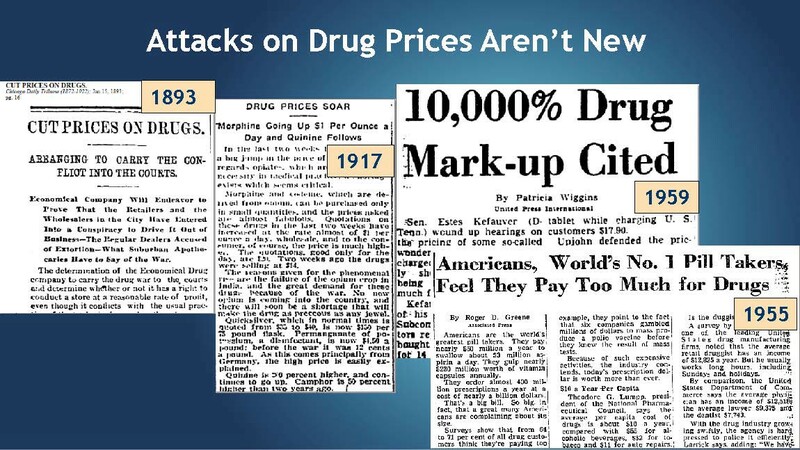 Our opponents have a 4-word message: “Drugs cost too much.” We would then respond with peer-reviewed studies thicker than War & Peace. So BIO created a repository of crisp, clear answers to commonly asked questions about drug pricing. 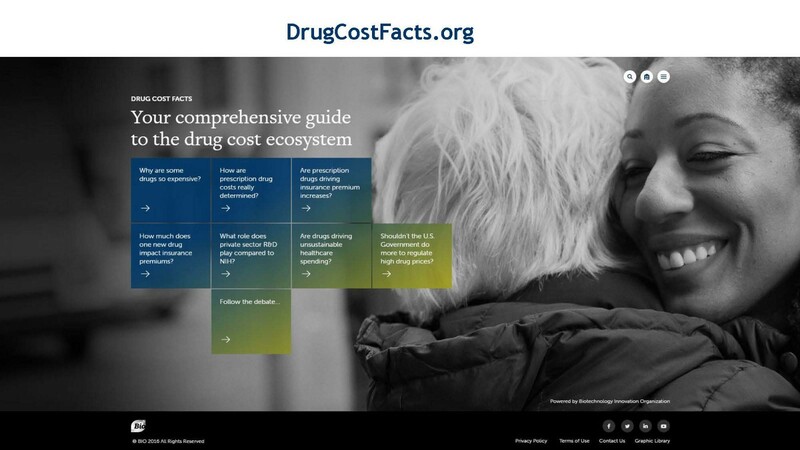 This month, we rolled out drugcostfacts.org. It’s a portal filled with facts, not opinions. Multiple sources are cited for every contention. The information changes regularly based on what bills are being debated on the Hill. Part of making America great again is empowering U.S. industries that are still leading the world. Even as globalization has reshuffled the economic deck for many workers, biotech companies employ 1.6 million Americans. We’re growing jobs at a rate double the national average, and we pay our people 80 percent more than the national average. We’re job creators. We’re life savers. We’re the future of health care. We’re lowering health care costs, and we’re healing, feeding and fueling the world. Jim Greenwood is a former six-term member of Congress and current CEO of the Biotechnology Innovation Organization (BIO), the world’s largest trade association representing the biotechnology industry.